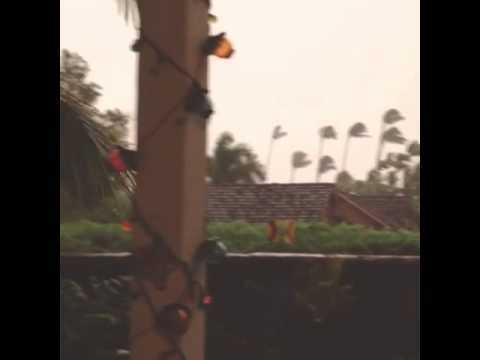 So, Hurricane Flossie downgraded to Tropical Storm Flossie downgraded to Tropical Depression Flossie, ultimately called just plain old Flossie, and true to her name, blew in to Maui tonight, with all of the brouhaha of what we'd consider a thunderstorm in New York. But the forecasts leading up to the storm scared us, so we over-prepared. We stocked up on food at Costco, filled the gas tank, got plenty of cash, bought way too many candles and bottles of water. When you live a block from the beach, on a little island in the center of the Pacific Ocean, it is indeed better to be safe than sorry. Of course, we thought through dinner thoroughly and in advance. What could be cooked quickly and without much prep, in case we lost power or the windows blew out or we were flooded by rain or sea? 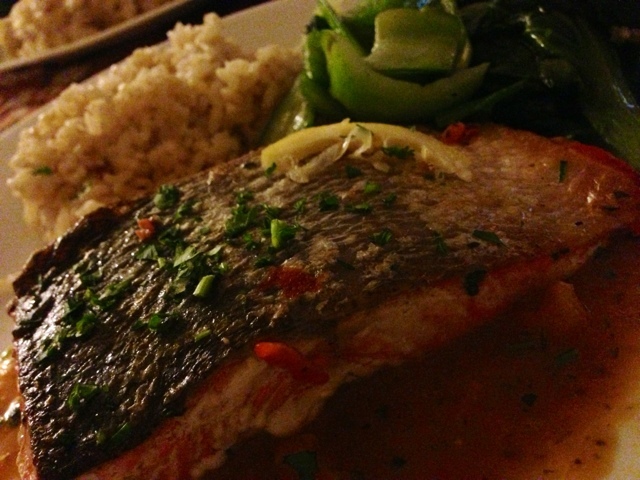 Pan-seared wild salmon with a white wine sauce, served with brown rice and simply sautéed bok choy was the consensus. 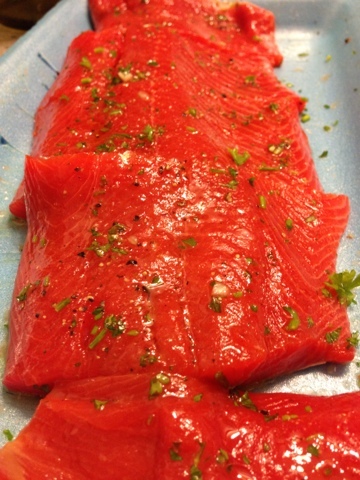 Clean and dry your salmon fillets. Add salt and pepper, to taste, as well as a small rub of olive oil to marinate the fish. We also rubbed a small amount of minced parsley on to the fish. Then, heat 3 tbsps of olive oil in a spacious skillet on a medium-high flame. Get the oil nice and hot, but not smoking. Drop in your fillets and sear each side for three minutes. That simple. You are going for a pleasant, crisp result here. If your skillet is not warm enough, the results will be less than satisfying. Too hot, and your fish will burn on the outside and remain uncooked inside. Three minutes each side, medium high heat should do you just fine. Pour this bright, beautiful sauce over your crisp fish and enjoy. This week, we signed the lease for our new restaurant space in Lahaina. Now, we just wait for the executed copy to come back to us and then we will officially be in business. Funny, how this this all played out. The plan was to take a year to get the lay of the land, learn the market and settle in, before we began the process of opening a new restaurant together. But Michele found the space on our morning coffee route, its location ideal, and called the landlord on a whim. We got an appointment for a walk-through and immediately saw the potential, but floated a figure half of what the landlord was asking. We were surprised when our offer was accepted and some other incentives were thrown in to sweeten the deal. The opportunity was undeniable. So, we took it. We celebrated this first step with after-dinner ice cream at Ono, under the full moon. Jada dove in to her favorite flavor, chocolate, and proceeded to cover herself with it. Asia and I always go for the avant garde specials. The key lime pie gelato lived up to their good name and was indeed ono ("delicious", in Hawaiian), with little flecks of graham cracker crust running through the silky, light ice cream. Mike stood by and stole little scoops from everyone, whenever we'd put our cups down or paused for a breather. Ono Gelato Company is an island franchise, but our local gelateria is the best of the bunch. No surprise, since the owners are Italian and third-generation gelato makers to boot. Their perfected craft is enhanced by the use of high-quality, locally grown ingredients in a casual, relaxed setting. The ideal formula for us, we always leave satisfied and inspired. God bless Costco. Every week, after picking up our produce, we head to the super store and flash our membership card at the front door greeter, confident that we don't need much, maybe some toilet paper or a couple of bottles of wine, and we walk out with $400 worth of goods in our cart. Not a bad hustle if you think of the millions of Americans who walk in with the same laissez-faire attitude but can't pass up the incredible deals that they find once they are inside, whether they need the box of sponges or the flat screen TV or the giant bag of peppers or not. 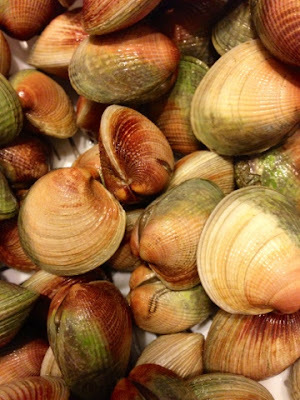 This week, we spotted some clams that completely changed our dinner plans. It didn't matter that we are a small family of four and that the bag of clams was three pounds. 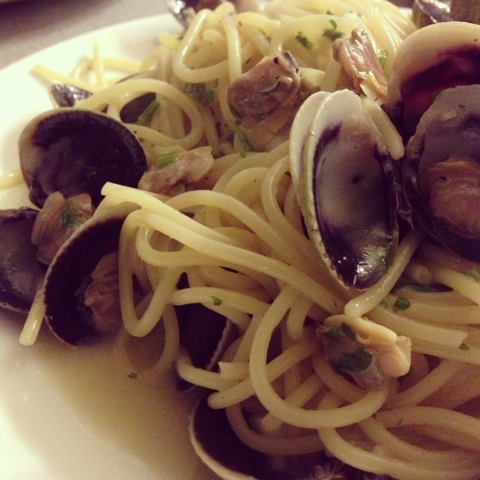 The clams were wild and beautiful and plenty and only $15. We had to have them. 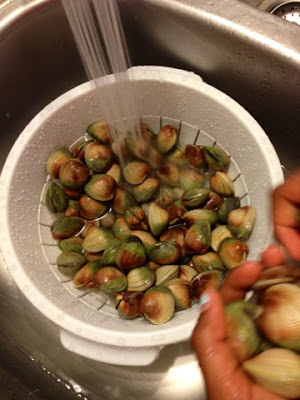 Clams need to be soaked in ice water, first thing. They relax and release sand and impurities in to the water that you do not want to flavor your meal. I usually let them sit in the fridge for at least thirty minutes. Then I strain them and scrub each one individually, tossing any that seem suspicious, chipped or that do not completely close. Time to cook. As with all pasta recipes, start with boiling water for your spaghetti. 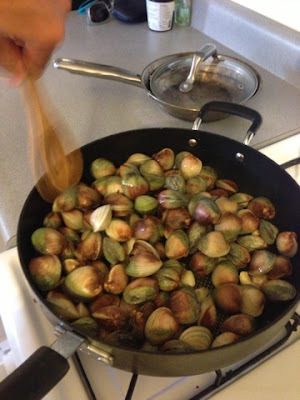 Then, slice 3 cloves of garlic and put them in a deep skillet with 3 tbsps of olive oil, over medium-high heat, until they are browned. Gently stir in the clams. Salt and pepper, to taste. These little guys cook quickly so move fast. After seasoning and stirring for two minutes, pour in 1/4 cup of white wine. 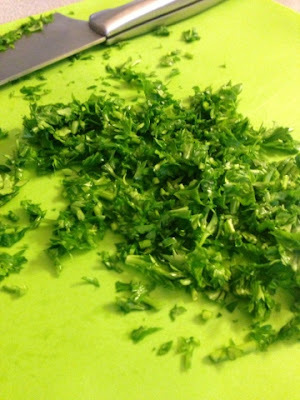 Sprinkle in a generous amount of chopped parsley. Integrate, remove the clams from the skillet and cover to keep them warm. You should be left with a beautiful broth in the pan. This will be the sauce for your spaghetti. Once your pasta is al dente, strain and drop in the spaghetti. Stir it in to the sauce until it is fully coated, then plate. We got pulled over by the cops today. Surprising, since Maui is the kind of place where people ride motorcycles without helmets and let their dogs and kids ride shotgun in the back of their pickup trucks. Maybe it was our white Countryman Mini Cooper with New York license plates that caught the cop's eye. Who knows? No matter where you are driving, it is never fun to be stopped by the police and it definitely a bummer to start your day with a major traffic violation. I had Jada on my lap in the back seat. She was strapped in with me but that wasn't good enough. They gave us a summons. Now, I would never have tried to pull this off in New York- or even on the local highway here- but a five minute drive on Front Street at fifteen miles per hour a.) did not seem like a real risk compared to some of the aforementioned antics of drivers here and b.) seemed like a small price to pay to get Jada to stop her incessant pleas for me to not to "leave" her for my 9am yoga class. Needless to say, I never made it to my class and we were completely wrong in our sleep deprived decision making process. We're probably getting a little too relaxed here too. But have no fear, my fellow mainlanders, Mike and I were snapped back to our natural, stressed out states after our run-in with 5-0. So, stressed out, in fact, that we immediately began making lunch as soon as we got back home. Chicken Milanese are pounded, thin chicken breasts, breaded with eggs, flour and breadcrumbs and pan-fried. We use panko-flakes in lieu of breadcrumbs though, better texture. Pound your chicken breasts until they are uniformly thin. Season with salt and pepper, to taste. Then, pour 1/8" of vegetable oil in to a skillet and get it nice and hot on medium-high heat. Next, scramble and season two eggs in a shallow bowl. Spread out a generous layer of flour on a large plate. Sprinkle this with salt and pepper too. Do the same with some panko flakes. (See, it's just like making fried chicken?) Dredge one chicken breast in the egg, then the flour, the egg again and then the panko flakes. Test your oil by flicking a little bit of the batter off of your fingers to make sure that you see and hear the appropriate sizzle in the pan. Drop in your chicken. Depending on the size of your skillet, you may be able to fit another breast in to the pan but don't crowd them. They will take longer to cook and you want this process to be as quick as possible. Four minutes on each side should do the trick. You are looking for a golden brown crust and a juicy interior. Plate the chicken and top it with a heap of arugula and halved cherry tomatoes. You'll feel better after the first bite. If you have leftover chickpeas from the Minestra Di Ceci, you can make this dish in ten minutes flat. A variation of Lidia Bastianich's Gramigna Al Verde Rustico, our Strozzapretti with Bok Choy, Chickpeas and Bacon was made on the fly and has everything you need in a well-balanced meal. Light and full of flavor, it is a perfect summer dish too. Start by boiling your water for the pasta. We chose strozzapretti because it was the longest dry pasta that we could find in our pantry. Gramigna is a long elbow macaroni so, in theory, the standard elbows could work too. Once your water reaches a rolling boil, add your pasta. Meanwhile, add 3 tbsps of olive oil to your skillet. Warm over medium high heat and drop in one, small sliced shallot. (Three cloves of sliced garlic could work just as well.) Add four ounces of match-sticked bacon and stir about three minutes. Sprinkle in as many or as few red chili flakes as you'd like, a half tsp. should be the max, and incorporate. Now, add one cup of cooked chickpeas. Stir. Add three cups of sliced bok choy. (Lidia's recipe calls for spinach but bok choy was the closest thing that we could find in the fridge.) Toss and season with salt and pepper, to taste. Check your pasta at this point. It should be al dente. If it is, drain the pasta but reserve a little more than a half cup of the water. Pour most of this in to the skillet and let everything simmer together for a few minutes. Now, drop the pasta in to the simmering skillet sauce. Toss it all together to makes sure all of the flavors and compoments infuse together. If the mixture is dry, add a little more pasta water. If it is too wet, turn up the heat and let the sauce reduce down. When it tastes ready, and as soon as possible, turn off the heat. Toss in one cup of grated parmigiano reggiano. Plate the pasta and garnish with a drizzle of olive oil. I've been reading Julie Powell's Julie and Julia: My Year of Co (Google Affiliate Ad). A fore-mother of the blogosphere, I am inspired by her modern day fairy tale, how she changed her life by experiencing and writing about food from her own unique perspective. This little blog is a small nod to pioneers like Powell and it got me to thinking: Who is my Julia Child? Whose book would I cook from cover to cover? Lidia Bastianich comes to mind, at least in this season of my life. 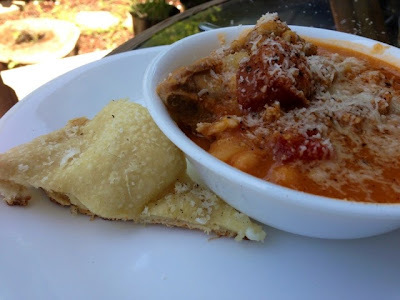 A bona fide nonna, her depth of knowledge and connection to the legacy that is Italian cuisine is beyond compare. Plus, her food is just plain good. As Michele and I prepare to open our next restaurant together, I look to artists like Lidia as guides. So, I cracked open an old copy of "Lidia's Italy" and decided to play. Here is our take on the book's first recipe, a nod to the Istrian influences of her childhood. 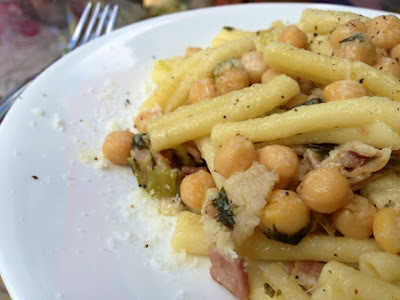 Minestra di Ceci is so much more than rejuvenated chickpeas. It is rich with a base of puréed vegetables and deep with the smoky feel of kielbasa and pork ribs. It went down easy, even on a summer day in Maui. We'll be working our way through "Lidia's Italy", and through the distinct regions of my second home, in the coming weeks. I hope you join us on the journey. Now, as promised, the first step. Drain and rinse the chickpeas and put them in a stockpot with the four quarts of water. Add the bay leaf and potatoes. Season with salt, to taste. Bring it to all to a boil. While that it boiling, you will make a pestata. This is a vegetable paste that, when cooked, will become the soffritto, or base, of your soup. If you are a mom trying to slip more vegetables in to your child's meals, you will be thrilled. The pestata for this soup is made from the onion, celery, carrots and garlic cloves. 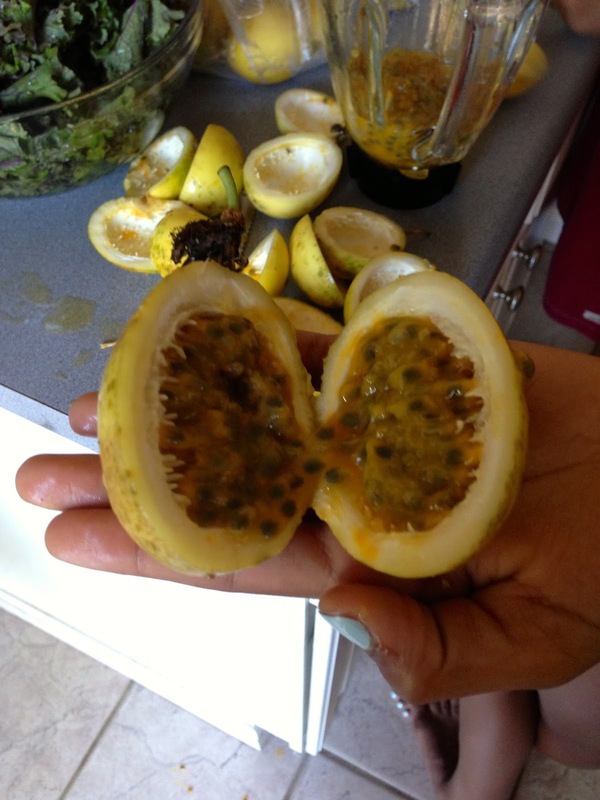 Put all four ingredients in to a blender or food processor and mince until it is a consistent paste. Find a big skillet, pour the olive oil in to it and set it over a medium-high flame. Stir frequently and cook for at least ten minutes. The water from the vegetables should be completely evaporated. 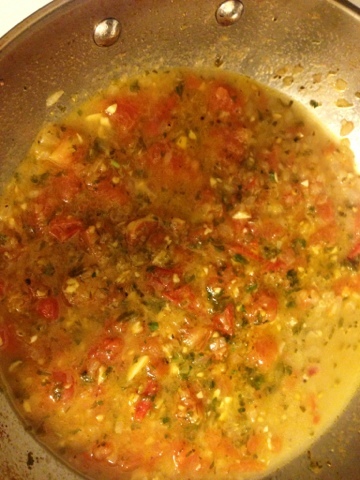 Then, stir in the crushed tomatoes and reduce these down for a few minutes. Throw the soffrito in to the boiling pot of potatoes and stir. Cover and boil. When the chickpeas have cooked for at least one hour, season the water again. Then, drop in the pork ribs. Boil for another half hour, partially covered. This will allow the soup to slowly reduce and intensify the flavors. The last ingredient, kielbasa, should be dropped in at this point. In thirty minutes, their flavor should infuse the soup with a rich smokiness. Now, scoop out half of the chickpeas and drop them in to your blender. 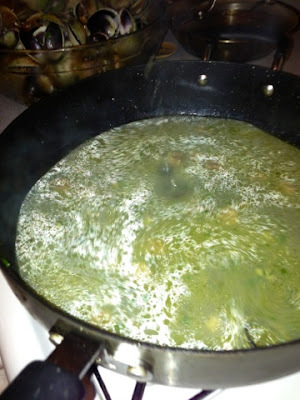 Add as much of the broth as you prefer to make a thick puree and then dump it back in to the soup. Simmer five minutes more. This will add a richer texture to the already deep flavor of this soup. It should be ready to serve. How you serve it is up to you. In Italy, we would pluck out the meat and serve it as a second course with bread and a salad. For the first course, the soup would be served alone, drizzled with extra-virgin olive oil and grated cheese and fresh pepper. Or you may opt, as we did, to ladle it all in to a bowl together with all of the toppings mentioned above. This dish is slow cooking at its best. Lazy Sundays come to mind. Make sure that you have enough time to savor the process, as well as the end result. Schiacciata is Italian for "flattened bread". 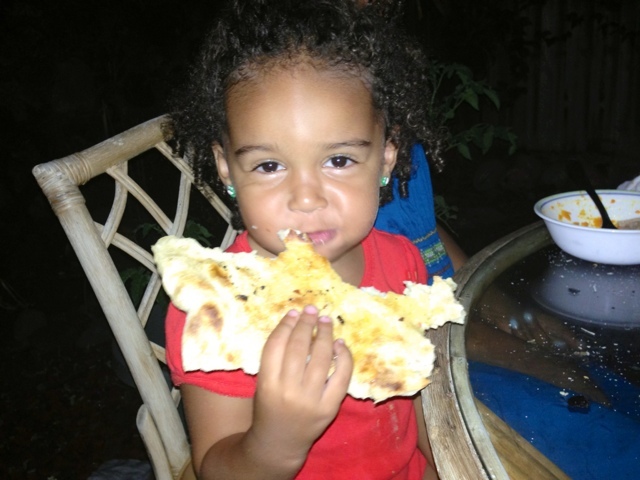 Some people compare it to focaccia but it is much thinner, lighter and crisper. Drizzled with a little olive oil, salt and pepper it is simple and divine. We made some a few days ago, when we were gifted a pizza stone by one of our new neighbors. Mike made the dough from scratch (with a recipe he conveniently forgets to share with me). 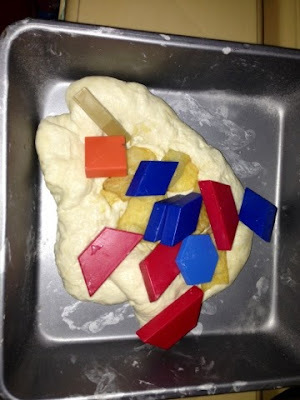 It is the same dough he uses to make pizza. Light and airy, it is even irresistible to Jada, who first wanted to eat it raw and then reluctantly conceded to accepting her own dough to shape her very own pizza. With Jada effectively distracted, we worked on prepping our sauce and mozzarella. When we turned around to check on Jada, it was clear that she's put a lot of thought in to her toppings too. Her pie didn't get put on the grill but the pizza stone put out some bangers for us. 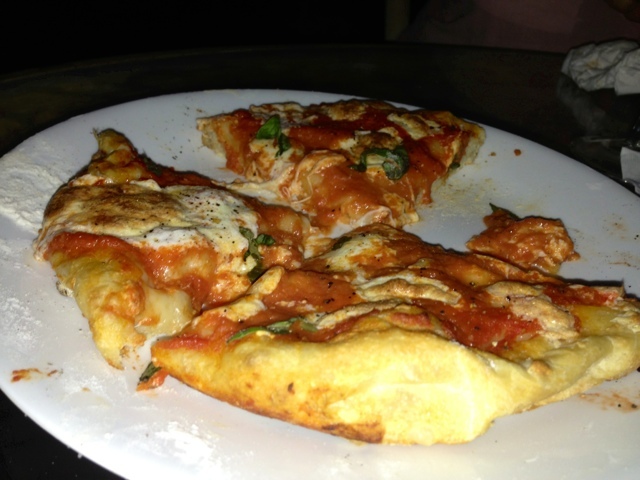 A firmer and crisper crust enhanced the warm cheese and tomato topping. The schiacciata was fantastic too. We got another parcel of daikon with this week's veggies. Stumped again, I searched for something more substantial than the recipe we tried last week. This one did the trick, tweaked from inspiration found in Gwyneth Paltrow's new book, "It's All Good". Braised and as stout as a steak in flavor and texture, the daikon rounded out a dinner of grilled teriyaki salmon, brown rice and bok choy. 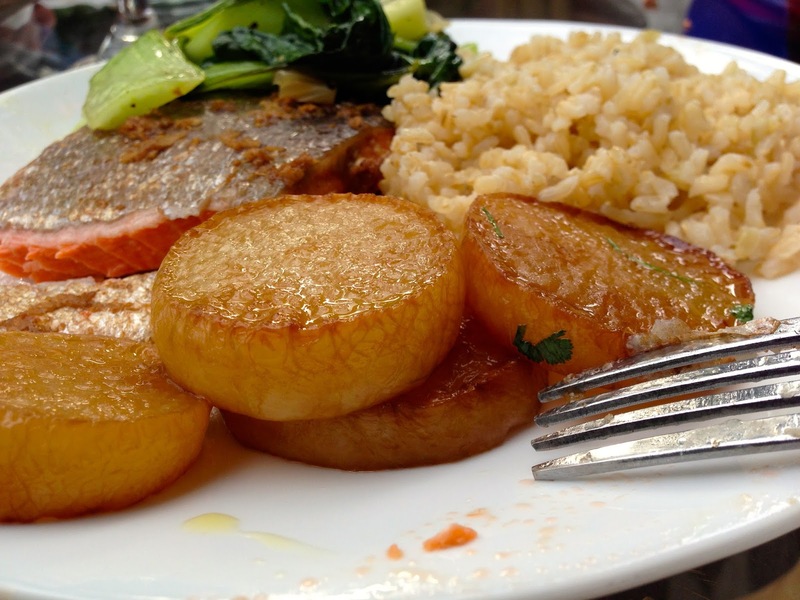 This will be our go-to daikon dish. You will love it too. Peel a daikon and cut it in to 3/4 inch rounds. If it has leaves attached, hold on to them. 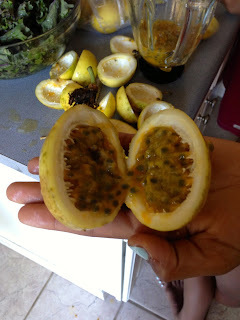 Wash and thinly slice those and put them aside. Heat 2 tbsps of olive oil and 1 tbsp of sesame oil in a frying pan over medium-high heat. Place the rounds of daikon in to the pan in one layer. Sprinkle each with a half-pinch of salt. Cook for five minutes. Flip and repeat. Each side should be browned. Then, drizzle 2 tbsps of rice wine vinegar and 1 tbsp of soy sauce over the daikon. Pour enough water in to the pan to cover each round halfway. Increase the heat to high until boiling. Cover and reduce heat back to medium-low. Cook 10-12 minutes. You will know that the daikon is ready when your force can pierce it easily. If you were fortunate enough to have daikon leaves, add these to the pot now. If you don't, a handful of cilantro will work wonders. Let the greens wilt, plate, coat them with any remaining sauce and serve. 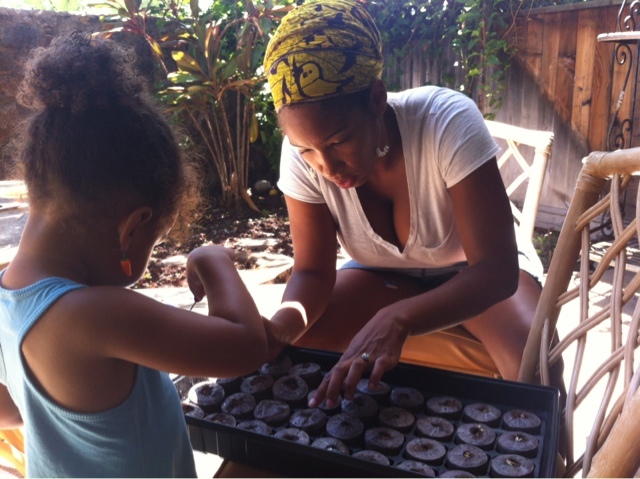 We've started our garden. I can appreciate beautiful flowers, but I only plant things that I can eat. Our first Maui planting includes tomatoes (five varieties, per Michele), eggplant, kale, onions, carrots, green and yellow zucchini, cucumbers and staple herbs like rosemary, parsley, basil and cilantro. A solid start. 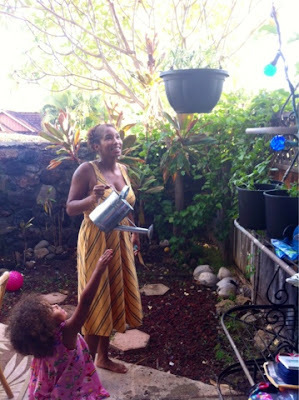 Michele says that everything seems to be growing right before our eyes. You blink and a seedling has pushed itself up an inch out of the soil. It's intuitive that the sun and soil would enhance the process and quality of food that we usually grow in NY, it is more lush and less hardy here, but it is still incredible to see our food flourish so quickly. Can't wait to get it all on the plate!